HESPERIA -- The author of a scathing portrait of Indian gaming spoke at the Hesperia Church of the Nazarene on Friday night, and he was preaching to the converted. About 60 opponents of a proposed casino attended the speech and book signing by Brett D. Fromson, author of "Hitting the Jackpot," which chronicles the tribal mayhem and political furor that has followed the creation of Foxwoods in Connecticut, the largest Indian casino in the United States. According to Fromson, all the local politicians who favored the casino have been voted out of office. As dark as his portrayal of Indian gaming in Connecticut was, Fromson had even worse things to say about California's. "You guys are going to have casinos everywhere," he said during a question-and-answer session, "and compared to the Connecticut Compact, California's is a really shoddy piece of work. 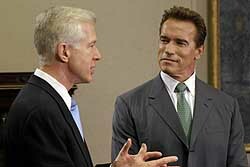 The guy who negotiated that for Gray Davis was a lunkhead. The California Compact gave away the store." Fromson said he had spent only two weeks in California, but that he found the dynamics of Indian gaming here "not that different from Connecticut." He said he was appalled at how ignorant of the gaming business local politicians were, and that Indian tribes are often fronts for sophisticated gambling operations with high-powered lawyers, noting that the Hesperia casino interests have hired a former head of the Bureau of Indian Affairs. He also called casinos "a hidden tax primarily paid by the working class," but said the political situation in California favors Gov. Schwarzenegger, who wants a bigger slice of Indian gaming revenue. "The tribes need to protect their exclusive franchise," he said. "If the governor opened up gambling to non-Indians closer to the big cities, the Indian casinos would be out of business overnight. "The gambling interests have a lot more to lose than you do," he said. "They want this more than you do -- they found you, you didn't find them." Fromson is a writer of long and prominent experience. A chief markets writer for TheStreet.com, he has worked for The Washington Post and Fortune magazine and published in the Wall Street Journal, the Economist and the New York Times. "This isn't about Indians," he said to the anti-gaming audience. "This is business. Get all the information you can. As Warren Buffett likes to say, if you look around the poker table and you can't figure out who the patsy is, then you're the patsy." An obvious scaremongering tactic, implying the land-into-trust process is out of control. Actually, the process is well under control; I'm not sure a single off-reservation casino exists in California yet. The governor has the power to veto any off-reservation deal, so the issue is up to Schwarzenegger. Since Californians voted for him in droves, his decision presumably will reflect the popular will. If they don't like his decision, they can vote for another candidate. See One Reason Why Arnold Won: His Attack Ads Involving Indian Gaming, and Their Larger Context and Significance for what actually happened. These comments imply the gaming Indians are crafty, stealthy, sneaking up to rob our homes and steal our children. That's why these new stereotypes are a variation of the old stereotypes, such as the savage Indian. More scaremongering. Some tribes make deals with "gambling operations"—i.e., well-respected corporations in the gambling business—because they lack the necessary expertise to start a casino on their own. That makes them a partner, not a "front." Fromson means Kevin Gover. I don't know if Gover is "high-powered," but he's an Indian and an expert on sovereignty issues and the federal recognition process. Whom else should the tribe hire to do their legal work: Johnnie Cochran? A "hidden tax" people pay voluntarily, which makes it no different than any other business transaction and not a tax. 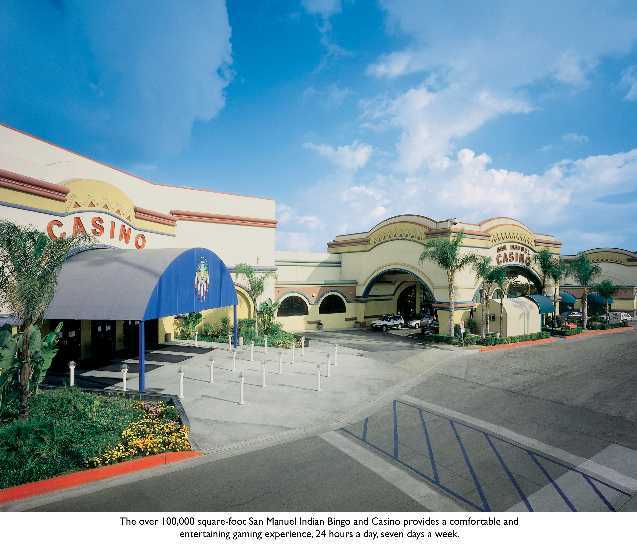 If a casino "taxes" a local community, it also helps it by creating jobs and businesses. The net effect is uncertain—studies offer conflicting evidence—but it's arguably better and probably no worse than any business that size. Isn't it? Has Fromson spoken up about the wide-ranging problems caused by selfish business interests: Enron and WorldCom, Halliburton and Bechtel, Wal-Mart and McDonald's? Because these corporate giants have a much greater impact on American lives than Indian casinos do. I'm guessing he hasn't. Until Fromson puts tribal gaming's few problems into perspective, I'd say his attacks are about Indians.